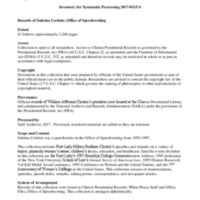 This collection consists of files maintained by Sabrina Corlette, a White House speechwriter from 1995 to 1997. It contains memorandums, speeches, speech drafts, remarks, talking points, correspondence, and newspaper articles. These materials relate to First Lady Hillary Rodham Clinton’s speeches and remarks on a variety of topics, primarily women’s issues, children’s issues, education, and healthcare.